Traditionally Angican Catholics bless themselves with holy water upon entering a church, and say a short prayer such as, "By this holy water and by your precious blood, wash away all my sins, O Lord." or some other similar prayer. Not only does this gesture contain the symbolism of signing themselves with the cross, it also is an act of symbolic purification. The water is also symbolic of our baptism. This practice was known to be in common use during the second century and may go back to the Jewish rite of purifying oneself before entering the Temple. 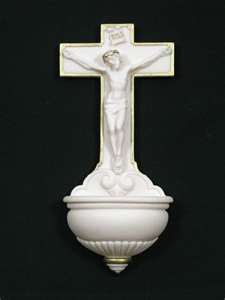 Holy water is blessed water, containing a measure of salt. The salt itself has a symbolic meaning: water purifies and salt preserves from decay. The church combines them, to preserve the faithful from relapsing into sin after having their sins washed away. The priest uses a solemn prayer to ask protection from the powers of darkness to bless holy water. At times, water is blessed for certain purposes, such as baptism. Holy water is used to bless the congregation (the Asperges, or "sprinkling") on Sunday, and to anoint the recipient during the sacrament of the sick. Many Anglican Catholic homes place a holy water font at the front door. We bless ourselves each time we leave, asking that the Triune God guide our thoughts, words and deeds as we go out into the world. We ask for His protection and guidance in all that we do. When we return, we bless ourselves again, calling to mind the sanctity of the home.